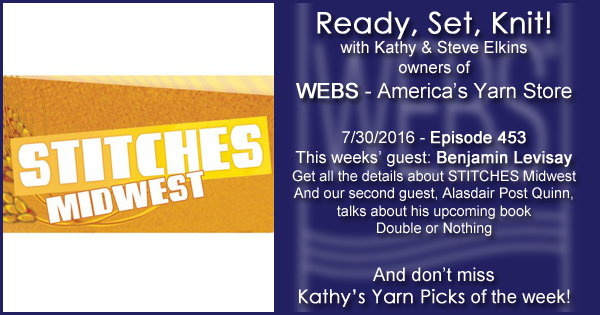 This week Kathy talks with Benjamin Levisay about the upcoming STITCHES Midwest. They chat about the importance of crochet, even for knitters, all of the amazing classes and events taking place that weekend as well as the great vendors on the show floor. Don’t forget to grab your 50% off admission coupon now! Kathy also talks with Alasdair Post Quinn about his upcoming book, Double or Nothing – reversible knitting for the adventurous. You can catch previews of the patterns and pre-order your copy on his blog! You can check out his first book, Extreme Double Knitting, now! Valley Yarns Taconic – NEW! 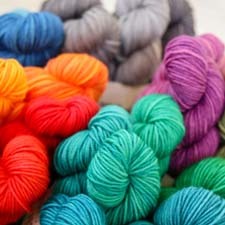 Valley Yarns Wachusett – NEW! WEBS will be at Convergence in Milwaukee, WI next week! August 2-6. This entry was posted on Saturday, July 30th, 2016 at 9:00 am	and is filed under Ready, Set, Knit Podcast. You can follow any responses to this entry through the RSS 2.0 feed. You can skip to the end and leave a response. Pinging is currently not allowed.